Talk about nine lives. Next month will mark 38 years since “Cats” premiered in London’s West End. (It opened a year later on Broadway.) Since then, the Andrew Lloyd Webber musical based on T.S. Eliot’s “Old Possum’s Book of Practical Cats” has been staged thousands of times all over the world. Not only that, but come December a feature film based on the stage musical will open with a star-studded cast that includes Jennifer Hudson, Taylor Swift and Idris Elba. In the meantime, Broadway San Diego is presenting a national touring production of “Cats” at the Civic Theatre downtown through Sunday. For those who’ve enjoyed the likes of Rum Tum Tugger, Mr. Mistoffelees, Mungojerrie and Rumpelteazer before, it’s a frolicking reunion with familiar feline friends. For those new to “Cats,” if there actually is anyone new to “Cats,” there are plenty of eyepopping costumes and special effects, and an iconic song to boot. That song, “Memory,” remains perhaps Lloyd Webber’s most poignant ballad. So resonant are its wistful lyrics and emotional atmospherics that it’s impossible not to be moved by it even after all these years. In this touring company, Keri Rene Fuller, as the aging cat Grizabella, delivers a powerful rendition worthy of the estimable women who’ve sung it in “Cats” before her, like Elaine Page and Betty Buckley. 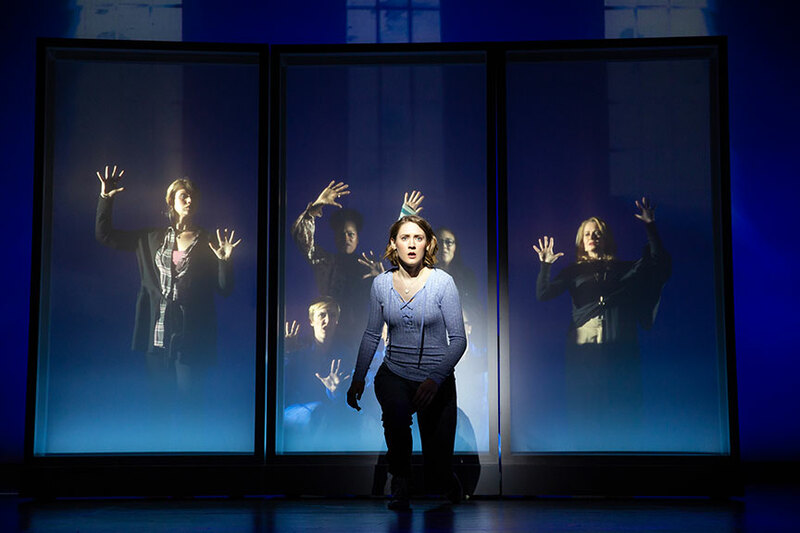 Among skeptics, “Memory” has often been regarded as the one memorable song from this musical, though its constant instrumental reprise throughout the nearly two and a half hour show may have something to do with that. But this production in town is a reminder that if “Cats” has no other song as enduring as “Memory,” it is not without additional charms. Best of all is the “Magical Mister Mistoffelees” number, complete with a light show, an audience hand-clap, conjuring and dazzling dancing by Tion Gaston. For the uninitiated or for those who’ve simply forgotten, the story of “Cats” concerns sage Old Deuteronomy (Brandon Michael Nase) choosing from among the Jellicle cats one to be reborn in the otherworldly Heaviside Layer. Until he does, the sung-through musical amounts to various colorful Jellicles introducing themselves by way of diverting dance-heavy tunes. Grizabella, left out of the fun, is treated as an outcast. But you know her day will come. Twenty years on (it debuted Off Broadway in 1998), the genderbending glam-rock show Hedwig and the Angry Inch feels less urgent and certainly less outrageous than it first was. But Diversionary Theatre’s legacy production of the show by John Cameron Mitchell (text) and Stephen Trask (music and lyrics) remains one hell of a hoot, as audiences at the University Heights space will testify. Diversionary’s Matt Morrow directs a powerhouse duo: Jeremy Wilson absolutely brings it as Hedwig, whose circular rise to fame is told in the one-act musical. Cashae Monya is just as dynamic in the supporting role of Hedwig’s partner, Yitzhak. This revival is also a reminder of how lyrical and revealing the show’s songs are, and at Diversionary The Angry Inch Band (Patrick Marion, Jim Mooney, Linda Libby and David Rumley) transform the theater into a rocking club. Thanks to Laurel Ollstein’s They Promised Her The Moon, the name Jerrie Cobb has been rescued from obscurity, at least at the Old Globe’s Sheryl and Harvey White Theatre. Cobb could and probably should have been the first woman in space (that distinction belongs to Soviet cosmonaut Valentina Tereshkova). But politics and sexism kept Cobb and 12 other women, dubbed the Mercury 13, from becoming American astronauts in the heroic era of John Glenn, Scott Carpenter and Alan Shepard. Giovanna Sardelli directs the West Coast premiere of They Promised Her The Moon, essentially a biopic-on-stage that follows Cobb (Morgan Hallett) from fearless pre-teen aviator through a record-breaking career in flying (with scenes ingeniously staged) and to the precipice of making history in the space race. The first act, interweaving Cobb’s upbringing by a doting father and a Bible-thumping mother with her adventures as a pilot and her grueling NASA tests, is engrossing and entertaining. Less so is the second act, specifically a heavy-handed showdown with overly loud congressmen. Yet this is a sincerely told story and a production buoyed by star turns from Hallett and Mary Beth Fisher as pioneering woman aviator Jackie Cochran. 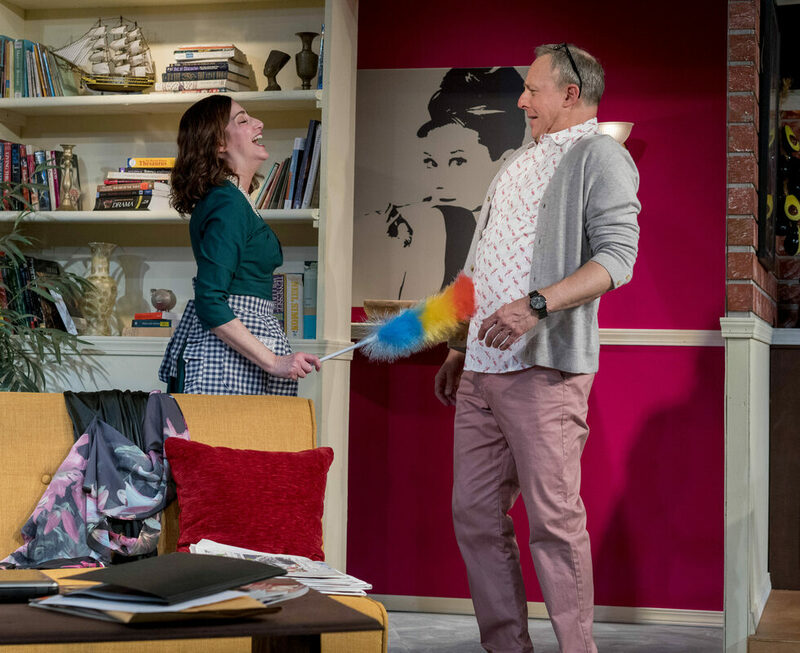 If good comedy is indeed all in the timing, North Coast Repertory Theatre has a hit on its hands. 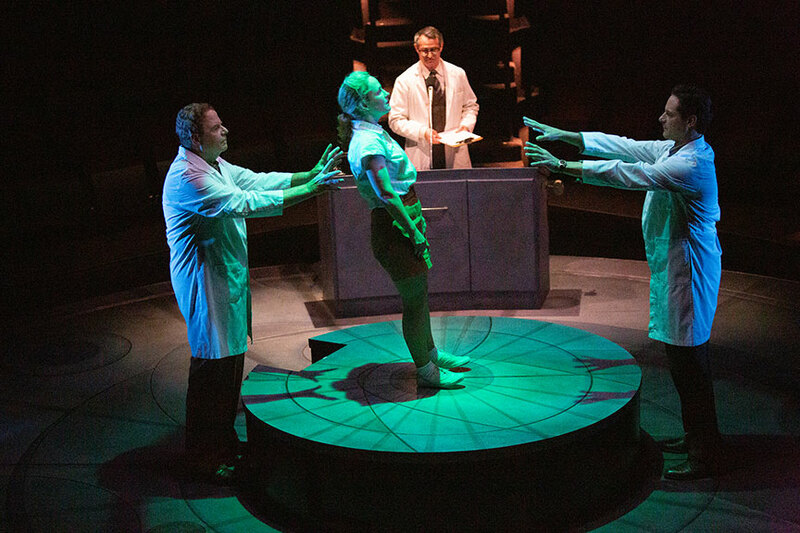 The Solana Beach-based company’s production of David Ives’ cleverly conceived exercises in wordplay and movement are as finely wound as the workings of a clock depicted in Marty Burnett’s set design. Having all kinds of fun on stage is an adroit ensemble of six, directed by David Ellenstein with a clear appreciation for Ives’ singular knack for the cerebral and the absurd. “All in the Timing” is comprised of a half-dozen Ives sketches or mini-plays produced between 1987 and 1993. The one-act comedies premiered together Off Broadway in ’93, and the compilation has been a popular theater attraction ever since. At North Coast Rep, one of the six original plays-within-a-play, “The Philadelphia,” has been swapped out for one titled “Foreplay, or the Art of the Fugue.” More on this gem later. The best of “All in the Timing’s” offerings are those that subvert theatrical convention. In “Philip Glass Buys a Loaf of Bread,” Omri Schein portrays the minimalist composer in an impeccably choreographed mingling of rhythmic language and a capella operetta. 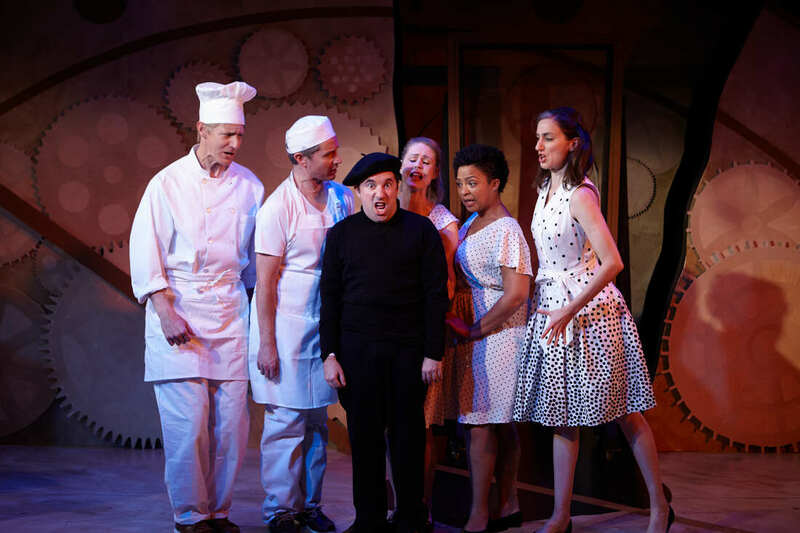 Like a signature “Seinfeld” episode, the narrative is really about nothing, but Schein and the rest of the ensemble (David McBean, Noelle Marion, Christian Pedersen, Taylor Renee Henderson and Uma Incrocci) make buying bread a joyfully hilarious experience. Likewise, in “The Universal Language,” McBean and Henderson maintain the zany momentum of an entire one-act about a school of “Unamunda” in which a con artist is teaching a new tongue (it sounds like witty gibberish) to a lonely, stuttering and gullible student. That this becomes an unlikely romance is a happy surprise. Speaking of romance, in two of Ives’ plays, “Sure Thing” and “Foreplay, or the Art of the Fugue,” would-be dating and dating respectively get the full rinse-and-repeat treatment. In “Sure Thing,” Marion and Pedersen meet by chance in a café in a seemingly familiar scenario. But each time a bell rings, the couple’s encounter takes a different comic turn, the result being that even William Faulkner’s “The Sound and the Fury” gets laughs. In “Foreplay,” a miniature golf course called Lilli-Putt Lane is the locale for three coinciding dates for a wannabe Don Juan named Chuck (played simultaneously by Schein, McBean and Pedersen) and three different women (Henderson, Marion and Incrocci). The inanity of mini-golf is actually exceeded by the ensuing antics. Schein, McBean and Incrocci go ape in “Words, Words, Words,” playing chimps under observation tasked with typing until “Hamlet” is somehow re-created. Finally, in the show-closing “Variations on the Death of Trotsky,” the circumstances of the Russian revolutionary’s assassination are served up as a crazy sight gag. Think axe in scalp. At 90 minutes total and with each of the one-act plays only about as lengthy as it should be, “All in the Timing” is a swiftly paced, farcical showcase for actors and a director at the top of their game. Alice Carter’s father is dead, just hours after their last conversation – a bitter, angry one. In the 16-year-old girl’s shock and torment, she blames herself. In Britta Johnson’s promising new musical Life After, however, the teenager’s search for answers to the unanswerable lead her in directions she never imagined. The entirety of Life After is told through the prism of Alice’s anxieties, self-recriminations and grief. When Alice (Sophie Hearn) isn’t expressing these feeling herself in words or in song, they are manifested through her perceptions of her older sister (Charlotte Maltby), her mother (Mamie Parris), her friend Hannah (Livvy Marcus) or through three omnipresent singers (dubbed by the playwright The Furies) who sound out Alice’s conscience and suspicions. Because Life After reflects the attitudes and emotional instability of a teenager, it’s able to venture over the top at times and even rely on humor in an otherwise dark context. Under the direction of Barry Edelstein, the Old Globe is presenting the U.S. premiere of the Canadian Johnson’s play, which opened in and received acclaim in Toronto. The plaudits are justified. Johnson wrote not only the book but the music and lyrics for Life After, and while only one of its numbers, the show-closing “Poetry,” stands out, the remainder do advance and add layering to the story. The theme of forgiveness of self and of others, especially loved ones, resides in the heart of Life After’s songs. Though Alice seems eloquent and wise beyond a girl of 16, she is a sympathetic and searching protagonist, and the expressive Hearn is well cast in the role. Bradley Dean inhabits with verve the larger-than-life part of Alice’s father, Frank, whose self-help books have made him a media star while taking him away from his family. Shining in support are Maltby as blunt sister Kate and Marcus for providing comic relief opposite Alice’s sadness and doubts. Backyard Renaissance's "Mr. and Mrs. Fitch"
Backyard Renaissance’s Mr. and Mrs. Fitch is a showcase for its actors, Andrew Oswald and Sandy Campbell, and a show-off for its playwright, Douglas Carter Beane. As the married co-authors of a snarky gossip column, Oswald and Campbell have as much fun as seems humanly possible on a stage for two hours. They trade quips and affectionate barbs, duet on Cole Porter (the play’s title comes from a Porter tune for the musical Gay Divorce), and in Campbell’s case rock beautiful evening gowns. The fly in the champagne, however, is Beane’s overindulged script, which works so damned hard to be cultured and sophisticated. As a result, the more Mr. and Mrs. Fitch ooze high-society bon mots and conspicuous literary references (to Blake, to Yeats, to Donne, to Hemingway, and so forth), the less believable they become. This does not detract from the joyful performances by Oswald and Campbell, whose chemistry and timing are impeccable. Director Francis Gercke appreciates the lively pace called for in this play, and his experienced actors never miss a beat. Each character has one extended monologue that interrupts the flow, but again, that’s courtesy of the playwright, whose 1997 As Bees in Honey Drown is just as clever but much more cohesive than the 2010 Mr. and Mrs. Fitch. As for the Fitches, in this tale they’re trapped (if living in a swank Manhattan duplex can be called trapped) between the wicked fun of churning out “celebrity” gossip and their growing contempt for new media (blogs, Twitter, et al) and the infotainment that is its life blood. When, more out of situational desperation than of guile, they invent a VIP celeb named Jamie Glenn, “he” becomes a tabloid sensation, with other scribes even co-opting his biography. This undoubtedly is Beane’s jaundiced, and justifiable, take on what constitutes news. But in Mr. and Mrs. Fitch the crisis never seems at all serious, nor is there any doubt that the Fitches, in spite of not being on the same page sexually (also played strictly for laughs), will carry on, martinis in hand. For its annual presentation of two shows in rotating repertory, Cygnet Theatre is staging a 25th-anniversary production of Tony Kushner’s epic Angels in America A Gay Fantasia on National Themes. The two-part masterpiece which, according to Cygnet program notes, Kushner pitched as being about “Mormons, Roy Cohn and AIDS,” gets an electrifying, all-out staging in Old Town with a strong cast directed by Sean Murray that includes Alex Bodine in the harrowing role of Prior Walter and James Newcomb as the despicable Cohn, both of whom are afflicted with the inscrutable and terrible virus. Part One: Millennium Approaches, which establishes the characters who interweave in Reagan’s 1985 America, showcases Kushner’s dexterity of language and razor-sharp perception of the body politic of the time. (Parallels to the present day are eerily appropriate.) The coming millennium and the emerging horror of AIDS fill the air with fear and extreme anxiety. Besides the visceral performances of Bodine and Newcomb, Connor Sullivan stands out as the emotionally and sexually conflicted Joe Pitt, and Will Bethmann brings manic ferocity to the role of Louis Ironson, Prior’s over-intellectualizing lover. The sound effects sometimes accompanying the narrative can be jarring, but they do not overwhelm the urgency of the story. Part Two: Perestroika is definitely the lesser of the two halves, though not by much. Fantasy sequences (or are they?) and a feverish scene between Prior and The Angel (Debra Wanger) contribute touches of surrealism, while elsewhere Kushner injects notes of outright humor into the unfolding drama. Perestroika does provide key moments to shine for Rosina Reynolds, who beautifully plays multiple roles throughout both shows, and for Kevane La’Marr Coleman, who reprises the part of a nurse and friend to Prior that he played in bygone ion theatre’s superb 2011 production of Angels in America. For a show with a limited premise –harried Brits forced to stand in for some Yank singers of cowboy ditties --- Chaps! packs plenty into its under two hours. The 1995 musical comedy by Jahnna Beecham and Malcolm Hillgartner melds Monty Python-like physical comedy and one-liners with “A Prairie Home Companion” folksiness, while paying tribute to singing cowpokes like Gene Autry. As if that weren’t enough, the story, set at a BBC radio studio in 1944, unfolds with the threat of German bombs bursting in air above. Somehow, all this comes together at Lamb’s Players Theatre under the direction of Robert Smyth. It does so not because Chaps! is any great shakes, but because the production relies on what Lamb’s does so very well: builds shows around intimate live-musical performance. (Its Once was a highlight of San Diego-area theater in 2018, and even its year-end Festival of Christmas was a musical delight.) The songs of Chaps! composed by everyone from Roy Rogers to Johnny Mercer may not be everyone’s cup of tea: They include “Ragtime Cowboy Joe,” “I’m An Old Cowhand,” “Jingle, Jangle, Jingle,” and “Tumblin’ Tumbleweeds,” among others. But the actor-musicians in the cast – Steve Gouveia, Manny Fernandes, Caitie Grady and Charles Evans, Jr. – make the tunes a treat for even city slickers in the house. While the setup of Chaps! would have been sufficient for a 10-minute skit, there are enough comic antics to divert in between the musical numbers. The funniest sight gag finds Fernandes pretending to perform ventriloquism with Evans dressed up as his dummy. Evans is a scene-stealer throughout, whether during this shtick or as Miles Shadwell, the BBC studio’s anxious, asthmatic producer. It’s perhaps inevitable that in a comedy like this one, somebody would dress up in drag. Ross Hellwig, mustache be damned, dons the frippery of a saloon girl in Act 2. From the sidelines throughout, Arusi Santi provides cartoonish sound effects to create the impression that the “Tex Riley” show is happening on the radio, and Jeanne Reith’s western costumes for all are bright, bodacious and authentic. Chaps! is slightly frantic but sweet sounding and family friendly. Not even World War II intrudes. As if the first year of college isn’t anxiety-inducing enough for California teen Lexi, she’s been sent off to the University of Connecticut by her mother with a cautionary urban legend planted in her head: there’s a serial killer with a hook for one hand who preys upon young women. Thanks, Mom. Whether the murderous madman is real in UCSD MFA grad Lauren Yee’s “Hookman” is purposely ambiguous. But there’s no shortage of graphic evidence in the 2015 play that Yee has referred to as an “existentialist slasher comedy” that he exists, at the very least on the power of suggestion. Blood turns up everywhere – on clothing, on knives, on Lexi’s own hands. The Hookman, meanwhile, is a masked figure naturally dressed in black. Or is he just in Lexi's mind? San Diego State’s School of Theatre, Television and Film is staging “Hookman” in association with Moxie Theatre under the direction of Moxie’s executive artistic director, Jennifer Eve Thorn. All the “Hookman” actors and crew members are SDSU undergrads or graduate students. “Hookman,” was actually workshopped in 2012 at UCSD’s Baldwin New Play Festival, the same year Moxie produced Yee’s “A Man, His Wife, and His Hat” (since retitled “The Hatmaker’s Wife”). With all the stage blood and the one-act play’s cutting takes on college life, “Hookman” is undoubtedly a treat for the students involved. Kennedy Garcia, playing the lead role of Lexi, admirably carries the show, which is presented in SDSU’s rather awkward Experimental Theatre. Her fellow actors, for the most part, are mired in one-note “type” roles: the text-obsessed roommate, the self-involved blond girl, the slacker-sounding boyfriend. The one supporting character who seems like a real person is Lexi’s best friend, Jess (Dominique Payne). A California flashback to a drive the two are taking from In-N-Out to the movies is “Hookman’s” hook. Jess ends up dead, killed by: A drunk driver? A murderer? Lexi’s reckless driving? The scene plays out three times in the makeshift chassis of a car onstage. This ambiguity, it turns out, is necessary for Lexi’s self-examination and confrontation with her fragile psyche. Everything that goes down in “Hookman” in between these fateful car scenes, from a grisly murder (the show’s one true fright) to a quixotic encounter at a memorial for the dead Jess, is presented as enigmatic or surreal or both. Further roiling the waters are Yee’s built-in musings on misplaced victimization, responsibility and culpability, and the complexities in general of trying to find one’s place as a young woman in the micro-society of college, one that can be unjust, high-pressure and even predatory. (Lexi confides to Jess, in one driving flashback: “I think I was raped.”) For existential heft, Joan Didion’s “The Year of Magical Thinking” is repeatedly name-dropped, too. A spirit of rebellious fun envelops the world-premiere musical Diana, which the “People’s Princess” might have well appreciated. 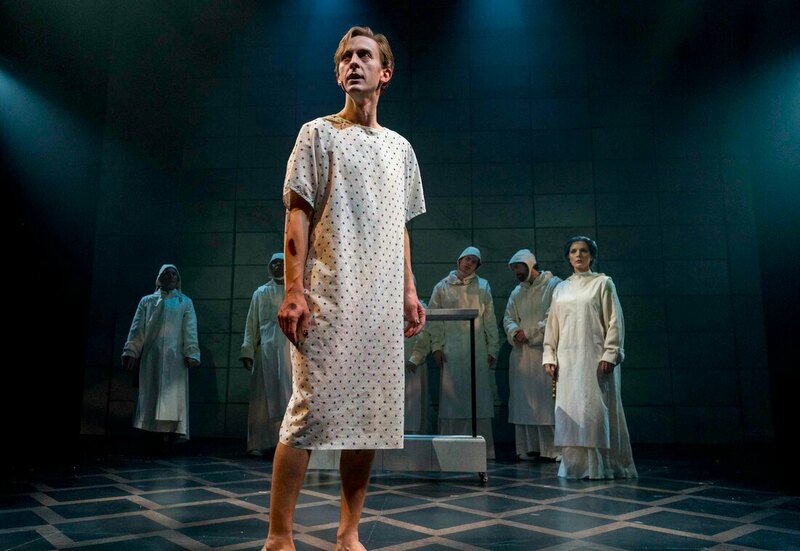 What in lesser hands could have been conceived as a pious bore is just the opposite in La Jolla Playhouse’s production written by Joe DiPietro and David Bryan. This “biopic” of a musical chronicles in whirlwind fashion (that’s saying something in a two-hour, 30-minute show) the life of Lady Diana Spencer/Princess Diana of Wales with tongue quite often in cheek. Whether it’s portraying the paparazzi in all its predation (the tune “Snap, Click”) or the liberated Di retaliation-dancing in her famous F-U dress (“The Dress”), this production directed by the Playhouse’s Christopher Ashley shines brightest when it’s not taking itself too seriously. The book by DiPietro leans heavily on the first stage of Diana’s (Jeanna de Waal) life, from her meeting with Prince Charles (Roe Hartampf) through their storied wedding, the birth of William and Harry, and up to the point where the princess realizes that her marriage is a sham and that Charles’ true love is the married Camilla Parker Bowles (Erin Davie). The post-divorce years do show Diana’s humanitarian efforts, but there’s no mention of boyfriend Dodi Fayed, and the accident that ended her life is treated briefly and very tastefully. The musical score has its share of swelling ballads, to each of which the gifted de Waal brings credible passion. But the novelty numbers featuring the press and the dress, and one introducing the hunky James Hewitt with whom Diana had an affair, are the most memorable. Judy Kaye does double duty as Queen Elizabeth and romance novelist Barbara Cartland, soaring over the top in the latter role, but who cares? Yet every performance except for de Waal’s is arguably eclipsed by William Ivey Long’s costume design, which in its attention to historical authenticity will blow away Diana fanatics and lifetime royals watchers. With its gravitas taking a back seat to spectacle and flash, Diana may disappoint the reverent and the proprietary. 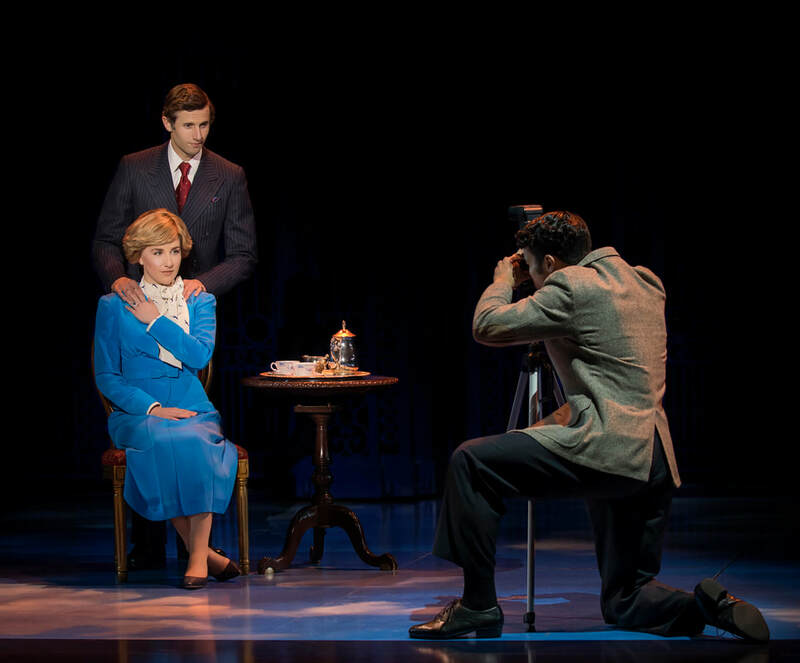 For others who simply crave a couple hours of pure entertainment – Broadway, anyone? – this show is sure to please.